I was driving home after a workout a few days ago, and I saw a bus. Not a big bus. Half-sized, or even smaller, but not the fancy new kind of bus. Very traditional. On the side, it said "Shaggy Pines Dog Park." At that moment, I realized my entire life had been a lie. I hadn't understood anything. I felt like the Grinch, with my heart growing three sizes. 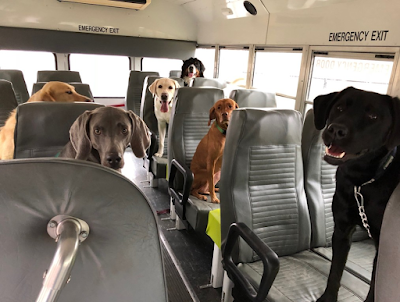 A bus to take elderly dog owners and their dogs to play. I'm not going to lie. I'm discouraged. I don't feel good about my country. About our country. BUT, on the other hand--we have a bus for dogs. Then, as I continued to drive, I felt a tiny hope grow in my heart. Was it possible, could I even dream, that the owners didn't even go with their dogs? That the driver honked his horn--surely, it would sound like a bark--and Burt Boxer or Chad Chihuahua or Penelope Poodle would come running out of the house and get on the dog bus, finding their seat without human assistance? That the bus driver would take them to play, bark his horn at the appropriate time, and they would return for the ride home? Oh, what a world that would be. We can do it now, people. We can survive the madness of America and Brexit and whatever else the damn world can throw at us, because dogs have their own bus to take them to play.